Christmas Tree—— an iconic symbol of Christmas that if it’s nowhere to be found during this festive season, you’ll know something is missing. 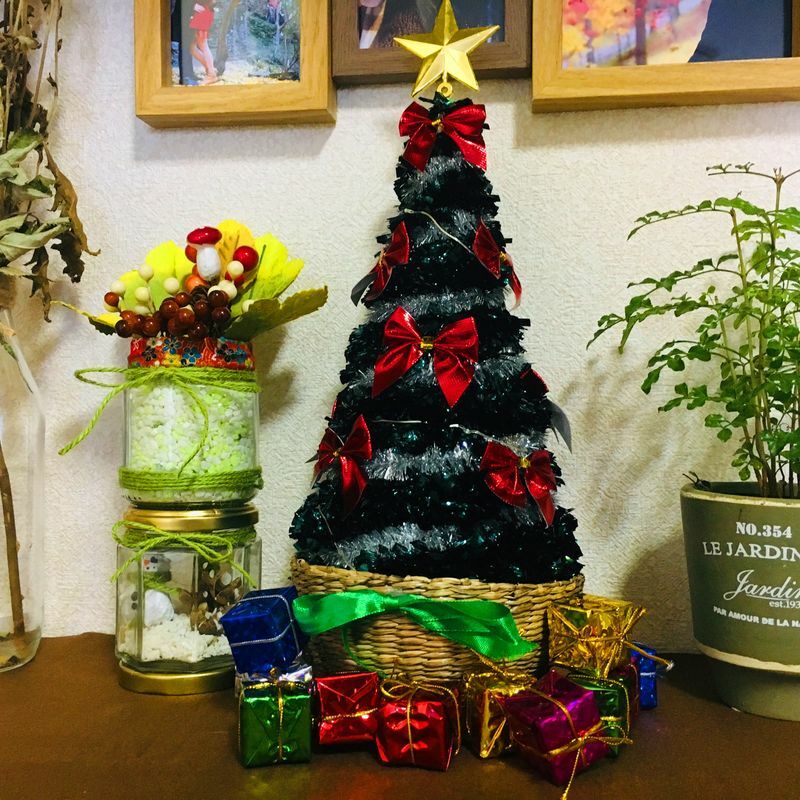 However, in Japan, Christmas is a holiday mostly celebrated by couples, so it’s uncommon to see Japanese houses with Xmas trees or Christmas ornaments of any kind. This makes me a bit sad because back home (in the Philippines), Christmas is not just an event with a bunch of lights and shopping sales, it’s a colorful season for giving and honoring the birth of Jesus Christ! That’s why Filipinos celebrate it from September to January! With that being said, I decided to have a Xmas tree in our (my partner and I) apartment to feel that warm and jolly Christmas spirit! But like your average Japanese apartment, we don’t have enough space for a tree. 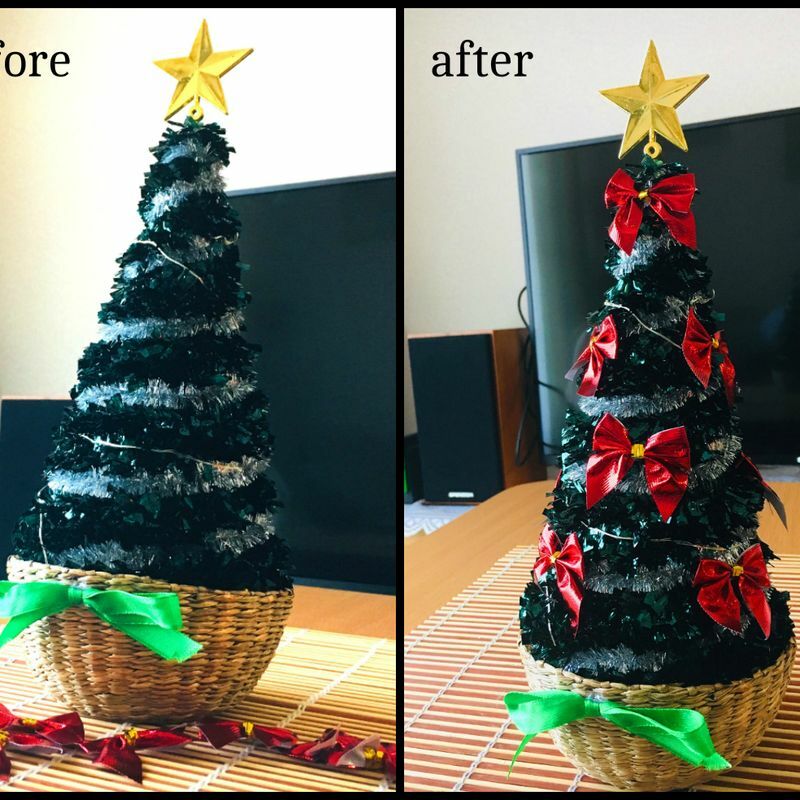 Disappointed but still persistent, we compromised with a “small tree” on our counter-top and do-it-yourself decorations made from recycled materials! We bought this tree from Daiso that is about 9-10 inches tall. A star is also included with it so no need to buy one. We also got a battery operated WIRE LIGHTS (the same store), which didn’t come with any batteries. This little tree is hollow, hence we could easily put the end of the wire lights underneath it. Then, just to add more height, I placed the Xmas tree on top of a basket that we were not using anymore. Instead of throwing it away, I varnished it to match the theme of my counter-top (which is dark brown and maple) and reused it. Moreover, I glue-gunned some ribbons around the tree and added some little tiny gifts. This time we got them from Seria. 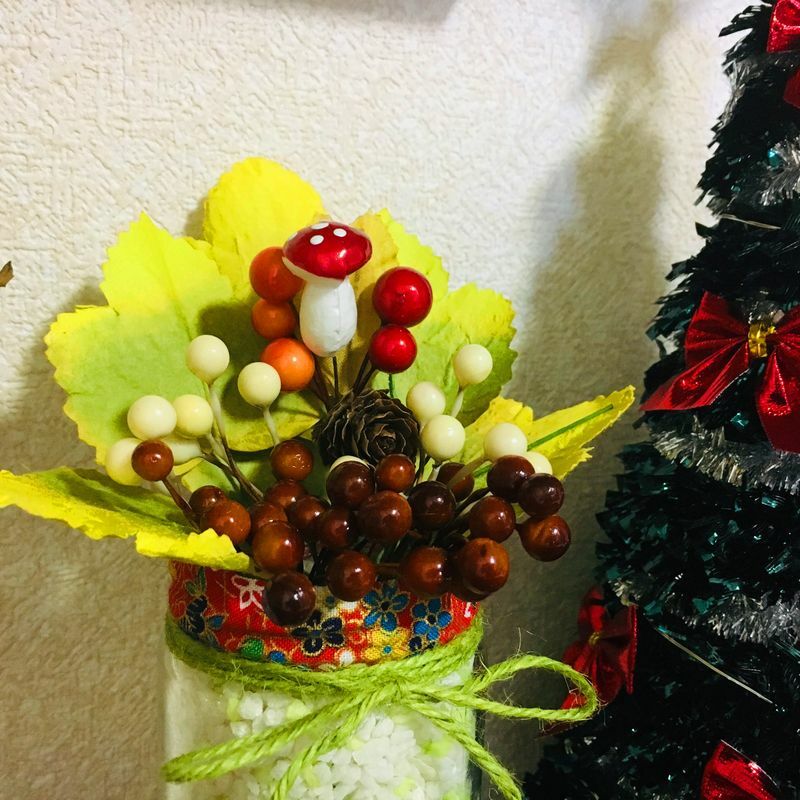 Not yet content with my decoration, I wanted to add more but I wanted to be as thrifty as I can because I had a lot of spare craft materials. I didn’t want to be wasteful. So, I looked around our apartment to get some inspiration, and to find something I can recycle. 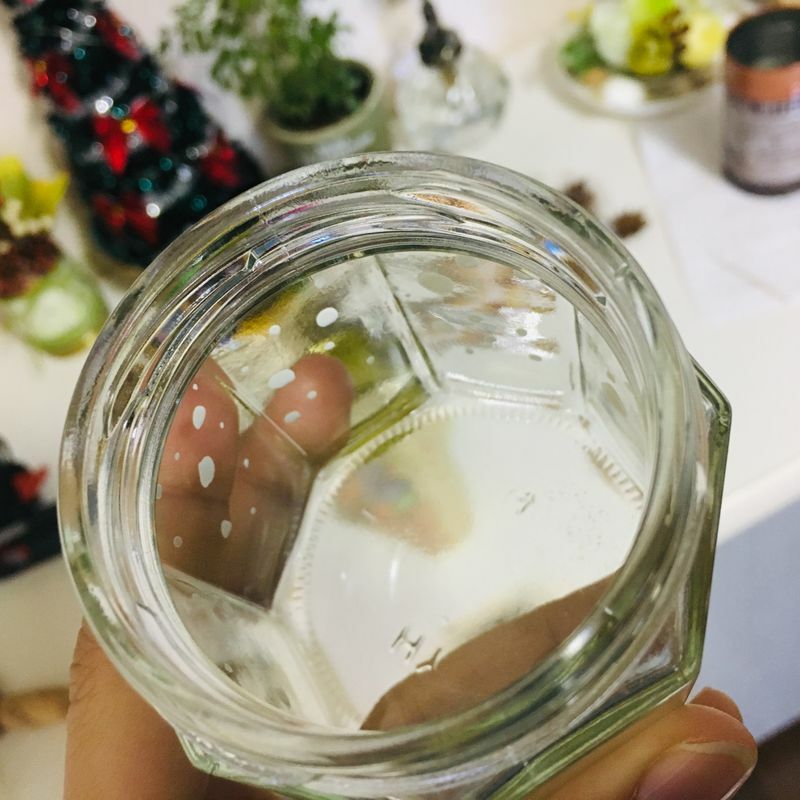 Suddenly, the used jars we had stocked in our cupboard caught my attention! The first ornament jar I made was very simple. I just put some white little stones, to support the faux plants I used as decorations, inside. 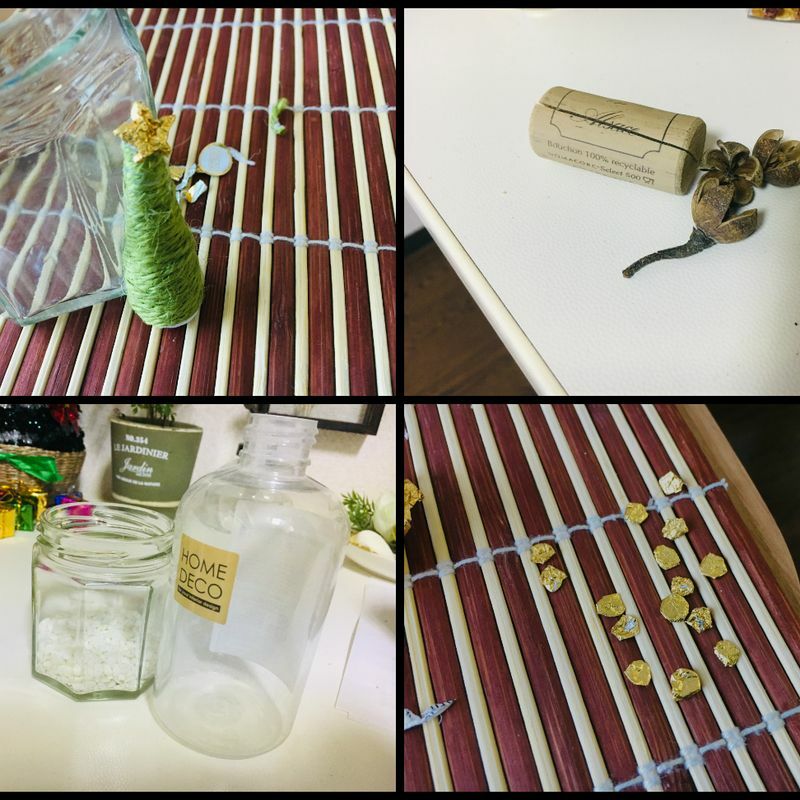 I covered the jar’s rim with a decorative cloth tape and finished it off with strings around its neck and bottom. I bought the stones, the cloth tape, and the faux plants in Daiso. 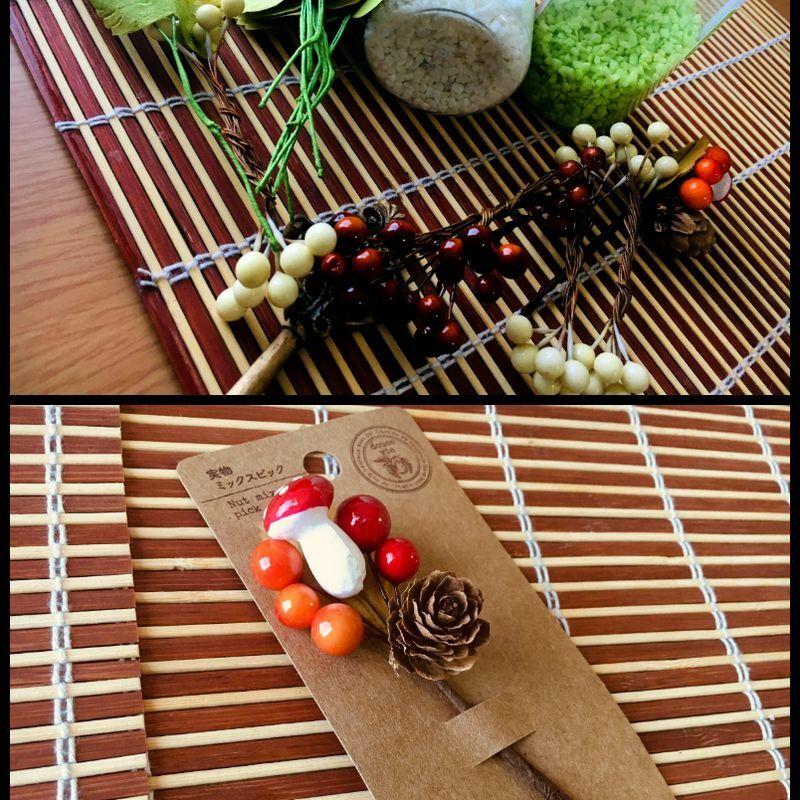 However, the string and the mushroom (the only one I recently bought) is from Seria. This is my favorite because I didn’t purchase anything NEW for it! For the snowman, I just crumpled up some scratch paper, shaped it like a snowman, drew on the details with a marker, and tied a string around its neck. After that, I glued it on a wine cork so it’s easier to assemble. I also added a dried plant beside it to add more design. Next, I made an even smaller XMAS TREE by shaping scratch paper into a cone, covering it with green string, and using Ferrero Rocher wrapper as an ornament for it! 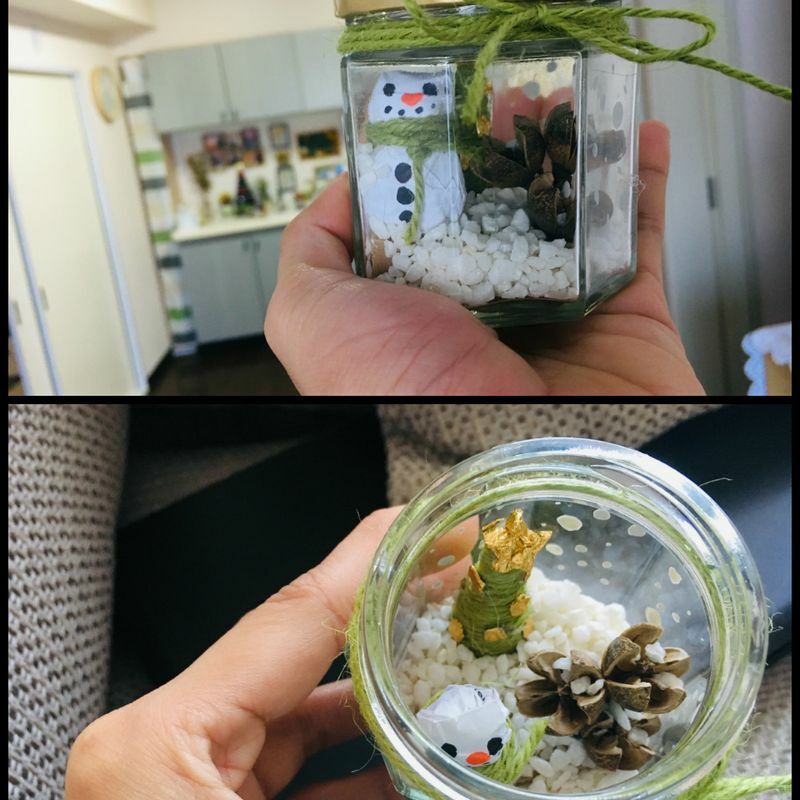 For the snow, I used my leftover white little stones and painted the inside of the jar with white dots. The process seems like a lot of work, but not that much. The most challenging part is DECIDING on the materials you’ll use and the DESIGN. 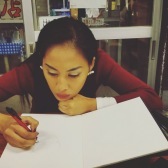 After you have planned it and you have a clear, or even slight, vision of your project’s outcome, it will be fine and you’ll have fun creating something out of nothing.